LA CHAUX-DE-FONDS, October 2012 – Known and celebrated for its innovative approach to displaying the time, Neuchâtel watch brand HAUTLENCE has reinterpreted its design codes to create an ultra-contemporary new collection: AVANT-GARDE. Where design meets creative watchmaking art. AVANT-GARDE is a sleek, powerful collection born of an alchemy of contemporary universes, largely taking its inspiration from the curves and aesthetic codes of avant garde design. Created in HAUTLENCE's Atelier d’horlogerie contemporaine, the first 3 models of this new collection offer an innovative, and seemingly weightless, approach to time display. The two multilayered dials create an exquisite play of depth and transparency to reveal the architectural balance of the piece. As you look inside, the eye is drawn ever inward to the unique transparent sapphire dial: the dial's upper face features a transfer logo, as well as luminescent minutes and indexes; its lower face includes a semi-opaque area and a metal coating made from highly polished rhodium or rose gold. Underneath, a base dial in silvered opaline or emblematic honeycomb further enhances the feeling of weightlessness. Luminescent numerals and indexes guarantee easy readability and reinforce the 3D effect of the jumping hours, retrograde minutes and subsidiary seconds. A sleek, curved ergonomic case which combines steel and titanium – covered by black DLC on some models - imparts strength and lightness to this new line which incorporates all of the brand's characteristic elements: HAUTLENCE in-house manual winding mechanical movement. Jumping hours and retrograde minutes using HAUTLENCE’s connecting rods system. Hand-drawn strokes and hand angled finish. Through the AVANT-GARDE collection, the brand launches ready-to-wear timepieces, HAUTLENCE is aiming to consolidate its future and enhance its creative offering. Titanium and steel case, bezel and bumpers covered by black DLC, 18-carat 4N rose gold crown and screws, silvered opaline base dial. Black caoutchouc strap, folding buckle. Titanium and steel case, polished steel bezel, silvered opaline base dial. Black caoutchouc strap, folding buckle. 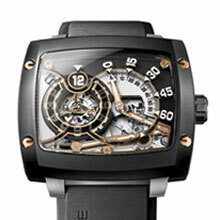 Titanium and steel case, bezel and bumpers covered by black DLC, honeycomb base dial. Black caoutchouc strap, folding buckle. Founded in 2004, HAUTLENCE – whose name itself is an anagram of Neuchâtel – pays tribute to the birthplace of the watchmaking art. The brand has been praised by watch collectors and aficionados from across the world for bringing a new dynamism to the art of fine watchmaking. HAUTLENCE has pushed the boundaries of traditional watchmaking codes, taking inspiration from the past and combining this with innovative mechanical solutions borrowed from other high-tech industries, with its architecture and designs displaying an unmistakable Bauhaus influence. This has inspired the brand to create new approaches to displaying the time, guaranteeing its place in the annals of watchmaking history. Designing and developing all movements in-house, the company has its own contemporary watchmaking workshop in the heart of the Swiss watchmaking metropolis, La Chaux-de-Fonds. HAUTLENCE timepieces are created and produced according to the very highest tradition of Swiss watchmaking, and their case-backs are stamped with the legend "Horlogerie Suisse". With the exception of the straps, all the components in the HL family are developed, produced and assembled in Switzerland - 90% in the canton of Neuchâtel. MODEL SUMMARY: HAUTLENCE in-house movement. Jumping hour, retrograde minute and seconds. Manual winding mechanical movement. DISPLAY: Jumping hours, retrograde minutes and seconds. Jumping hours, retrograde minutes with connecting rods system. CASE: Bezel and Bumpers: Steel covered by black DLC, bezel screw in 18-carat 4N rose gold. Glass: sapphire crystal, multi layer anti reflecting treatment. Crown: polished with HAUTLENCE logo: 18-carat 4N rose gold. Back: 4 screwed sapphire case back with stamps and officials engraving: “HAUTLENCE” and “Horlogerie Suisse”. DIAL :Sapphire dial: Upper sapphire dial face with printed logo, white superluminova minutes and indexes. Lower sapphire dial face with 4N rose gold metallization and semi-opaque black area. Hour disc in transparent mineral glass with 4N rose gold metalized hours figures and white superluminova. Minutes hands, laser-cut profile and polished 4N gold with white superluminova arrow. Silver opaline dial with white figure printed. Superluminova connecting rods, hand angled and linear fine brushed and 4N gold plated. STRAP: Caoutchouc strap. Interchangeability lugs. CASE: Bezel and Bumpers: Steel 316c. DIAL: Sapphire dial: Upper sapphire dial face with printed logo, blue superluminova minutes and indexes. Lower sapphire dial face with shining rhodium metallization and semi-opaque black area. 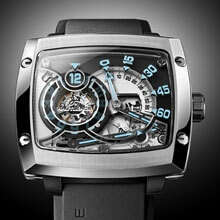 Hour disc in transparent mineral glass with rhodium metalized hours figures and blue superluminova. Minutes hands and blue superluminova arrow. Silver opaline base dial with black figure printed. Superluminova connecting rods, hand angled and linear fine brushed. Folding buckle, 18-carat 4N rose gold. CASE: Bezel and Bumpers: Steel covered by black DLC. DIAL: Sapphire dial: Upper sapphire dial face with printed logo, orange superluminova minutes and indexes. Lower sapphire dial face with shining rhodium metallization and semi-opaque black area. Hour disc in transparent mineral glass with rhodium metallized hours figures and orange superluminova. Minutes hands and orange superluminova arrow. Honey comb base dial with printed figures. Subscribe to the HAUTLENCE newsletter at www.hautlence.com, newsletter.